[en] Mulberry leaves (scientific name: Morus alba L English name: Mulberry) is a deciduous tree of the family Moraceae growing nationwide. There was also a custom drunk as a tea, mainly in sericulture areas, with plants that have been used for a long time as serow of silkworms. Mulberry leaves are not used, mulberry branches, root skin, mulberry seeds, etc. have been used as traditional Chinese medicines for a long time. The effect and efficacy of mulberry leaves improve prevention and improvement of diabetes, suppression of increase in blood glucose level after meals, improvement of hypertension, lower neutral fat value, lower cholesterol level (LDL cholesterol), improve intestinal environment and improve constipation To improve, liver and kidney functions are various. Recently the diet effect of mulberry leaves is also drawing attention. It is said that mulberry leaves work well for people with high blood glucose level, obesity, high cholesterol level, high neutral fat value, prevention of lifestyle diseases, etc. "1-deoxynojirimycin" is the key ingredient of the mulberry leaf's blood glucose suppression effect. The carbohydrate ingested from the meal is absorbed into the body by the function of α-glucosidase enzyme on the wall of the small intestine. "1 - deoxynojirimycin" inhibits the action of α - glucosidase, so it slows absorption of glucose and suppresses an increase in blood glucose level. The binding of "1-deoxynojirimycin" is relatively loose, so it does not inhibit the absorption of glucose, it will be slowly absorbed. As a result, the surge of blood glucose after eating is suppressed, and it is effective for the prevention and improvement of diabetes. This action is the so-called action of the low insulin diet itself, and as a result it improves to a constitution that is difficult to get fat to prevent fat accumulation in the body. It is also said that it has a function to suppress blood lipids. Mulberry leaves have a mild diet effect because of the nature of slow absorption of sugar. Others Flavonoids and dietary fiber contained in mulberry leaves reduce cholesterol and triglyceride levels, prevent oxidation of LDL cholesterol by active oxygen, and prevent arteriosclerosis. Mulberry leaves are well-balanced health food for humans. Furthermore, it is said that GABA which is one type of amino acid, has the effect of decreasing fat and cholesterol from blood vessels and liver contains 84 times of soba and 40 times of tea. It is said that the effect of GABA can lower blood pressure and prevent arteriosclerosis and middle wind. In addition, many nutrition such as abundant vitamins (vitamin A, vitamin B 1, vitamin B 2, vitamin C) and minerals (zinc, iron, magnesium, calcium), dietary fiber, flavonoid, carotene, γ-aminobutyric acid (GABA) Effective ingredients are included and there are diabetes prevention, hypertension prevention, neutral fat reduction, cholesterol lowering, constipation improvement, liver / kidney function upward, diet effect and so on. Mulberry leaves contain abundant nutrients that modern people hardly eat, such as calcium equivalent to 60 times the cabbage, iron equivalent to 15 times the Komatsuna, and 10 times the spinach carotene. Experiments using rats have been reported to suppress the increase in body weight and to reduce neutral fat and cholesterol levels in mulberry leaves. Basically, mulberry leaves contain vitamins and minerals rich, as well as leaves used in other green juice, and also contain excellent nutrients such as dietary fiber and protein · carotenoid · chlorophyll. Mulberry leaves are famous as leaves that become sericulture of silkworms in the past but mulberry roots and bark are also crude drugs called mulberry leaves (yakkuhi), and have diuretic action, blood pressure lowering, hypoglycemic action , Antipyretic effect, cough suppressing effects and other effects. Combined use of mulberry leaf extract, propolis and gymnema, banaba, onion concentrate (quercetin) etc. show the effect of improving blood glucose level and diabetes. Mulberry leaves prevent obesity by suppressing the rise in blood glucose levels. It is important to take these appropriately according to your purpose. For example, if it is intended to improve diabetes or diet, it is necessary to suppress the sudden rise in blood glucose level after meals, so it is effective to take it before meals or while eating. 【Effects and indications expected with mulberry leaves】 Lifestyle disease prevention · sterilization · anti-inflammation effect · rough skin · whitening effect · hair growth promotion · diet effect · normalization of cholesterol level · intestinal action · anticancer effect 【Effects / efficacy of mulberry leaves are effective symptoms】 Diabetes · hypertension · anemia · pollinosis · metabolic syndrome · menstrual irregularity · liver and kidney function deterioration 【Active ingredient of mulberry leaves】 It promotes moisture metabolism in the body, and drains waste and excessive salinity out of the body. Measures against radioactive material Improvement of hypertension Diet · Detox effect Cellulite resolution Elimination of swelling and swelling About 24 times the content of milk. About nutti about 15 times as much iron! Prevention of osteoporosis Prevention of arteriosclerosis Improvement of hypertension Eliminate irritation Hormonal balance adjustment (female) Especially beauty in skin such as intestinal cleansing can be effective for beauty such as skin. 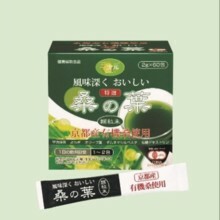 Also known as "green blood" antioxidant effect Blood smoothness effect Prevention of cancer Prevent and improve anemia Decrease in cholesterol It is effective for prevention and improvement of diabetes. Suppress rapid rise in blood glucose level occurring after meals Suppression of excessive calorie intake It controls excessive absorption of glucose It improves the secretion of insulin Constipation resolution diet ■ Hypoglycemic effect is strong "Hypoglycemic effect is the strongest among green plants" A study on the effect and efficacy of mulberry leaves is underway at Tohoku University School of Medicine, and as a result of its research, blood pressure lowering effect was observed in mulberry leaves. Furthermore, it was confirmed that the hypoglycemic effect is the strongest among the green plants. One of the excellent ability of mulberry leaves is "anti-diabetes action". It is said that if you eat "onion" in line with mulberry leaves, you can further increase its effect. ■ Can be expected for diet effect "It suppresses excessive intake of calories" The diet effect of mulberry leaves has also been confirmed in animal experiments. It inhibits the action of glycolytic enzymes and suppresses excessive intake of calories. By suppressing sugar absorption, it is possible to suppress elevation of blood glucose after meals, which leads to prevention of obesity. The ingredients of mulberry leaves also have the effect of preventing fat accumulation in built-in. Attention is required for visceral fat type obesity. Because it triggers diabetes, blood vessel disease and various lifestyle diseases. What is the effective way to take mulberry leaves? If you expect to control the blood glucose level of mulberry leaves, please take it 15 minutes before meal during meals. If it becomes after meal, the effect of mulberry leaves will become thin. Before meals or after meals, the efficacy of mulberry leaves can not be expected much. ※ The same is true for diet purposes. 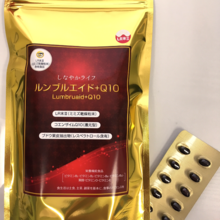 [en] ■ LR End Ⅲ "Lumbluade + Q10" "Lumbluade + Q10" is a "nutritional function food" that contains the worm-dried powder "LR-End III", "reduced coenzyme Q10" manufactured by Kaneka Corporation, and grape peel extract "resveratrol". Please try as a partner to stay healthy every day. Coenzyme Q10 of "reduced type" is a soft capsule because of the quality that is easy to oxidize. Other nutritional supplements include Vitamin B1, vitamin B2, vitamin B6, vitamin B12, folic acid, vitamin D and vitamin E. One of the major features of this product is the production of the Red worm from the raw material, and the powder and the manufacturing process Japan. Lumburgsurberus is the scientific name of the Red worm native to the west, and the initials of "Lumbricus Rubellus" may be expressed as "LR". It is the worm dry powder that the one that the Lumburgsurberus was processed to take it as a food and was made dry powdered, and the LR end (El Halles). 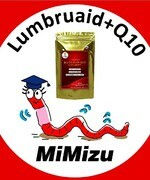 LR is a component that is used as a healthy food in the domestic Japan, and this red earthworm is purified and powdered as a raw material, under strict quality control and sterilized. Rumble Rubellus (LR-Ⅲ) manufacturing process the worm used for the powder of LR-end Ⅲ is screened from the fertile soil of Miyazaki, under the management of the sanitary, temperature and moisture content of dense soil, It is bred by a peculiar aquaculture technology while taking advantage of the breeding power of about 1000 times per year. "El Earl's End III product" which was powdered using long-term research knowledge and patent technology farmed in a dedicated facility with thorough hygiene management has a special label or display that displays "LR End III" or "El Earl End III" to differentiate it from other. In particular, this third-generation earthworm raw material is a worm-dried powder that has been powdered by the manufacturing method, which is recognized as a patent from only one country. [Japan Country Patent] No. 4808822 【 patented countries 】 Korea, China, Australia, Taiwan, Canada EU countries, Hong Kong S.A.R. The United States Russia Brazil India, Philippines Israel ■ LR End Ⅲ "Lumbluade + Q10" features "LR-Ⅲ Manufacturing Method" patented LR-Ⅲ acquired a Japan patent for the new manufacturing method of end-of-year [patent: No. 4808822]. Japan Patent No. 4808822 Korea No. 10-1198192 China zł 2011 8 0004473.3 Australia no.2011338109 Taiwan No. Ⅰ 376226 Canada no.2804129 EU countries no.2484369 (Belgium, Germany, Denmark, Spain, France, UK, Hungary, Italy, Monaco, Netherlands, Switzerland) 【 Patent Pending 】 USA, Russia, Brazil, India, Philippines ◆ Reduced Coenzyme Q10 Coenzyme Q10 is found in almost all somatic cells, and there are two types of coenzyme which are essential for producing energy: oxidation type and reduced type. Coenzyme Q10, which is sold in supplements and other products, was previously "oxidized". 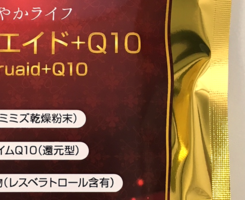 However, Coenzyme Q10, originally made in the body, is a reduction type. When the "oxidized" coenzyme Q10 is ingested, it is necessary to convert it into a "reduced" type in the body. The reduced coenzyme Q10, which does not require conversion, can be supplemented efficiently. It is originally made in the body, and a lot of safety tests and clinical trials are done, and safety is confirmed. Since it is oxidized immediately when it touches the air, mass production is difficult, but now we can produce a large amount of "reduced coenzyme Q10" Same as the body by the newly developed patent process. ◆ How to use: 2 to 4 capsules per day, please enjoy with water or lukewarm. ◆ This product differs from the food for a specific health care, and it is not the one that the Commissioner of the consumer agency has received the individual examination. 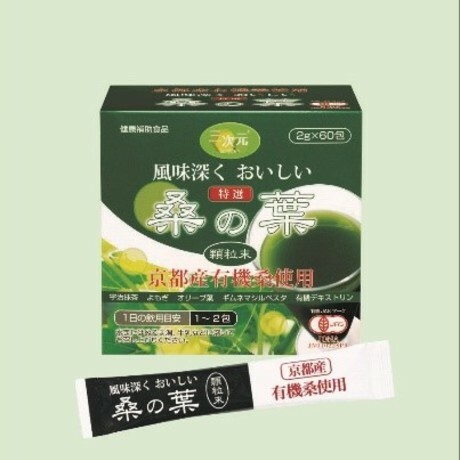 ◆ This product is not the one that the sickness is cured by a large amount of intake, and health is improved more. Please observe the amount of daily intake. ◆ Please do not eat if you are allergic to food by referring to raw materials. In addition, there is the case that does not meet in rare circumstances by the condition and constitution. In that case, please stop intake. ◆ If you are taking medicine or visiting a doctor, please consult with your physician. ◆ There are some color differences and smell peculiar to the product, but there is no problem in quality. Please put it out of reach of infants. ◆ Please avoid the use of the pregnant woman or the nursing person. ◆ Folic acid is a nutrient that contributes to the normal development of the fetus, but the growth of the fetus is not good by a large amount of ingestion. Mulberry leaves (scientific name: Morus alba L English name: Mulberry) is a deciduous tree of the family Moraceae growing nationwide. There was also a custom drunk as a tea, mainly in sericulture areas, with plants that have been used for a long time as serow of silkworms. Mulberry leaves are not used, mulberry branches, root skin, mulberry seeds, etc. have been used as traditional Chinese medicines for a long time. The effect and efficacy of mulberry leaves improve prevention and improvement of diabetes, suppression of increase in blood glucose level after meals, improvement of hypertension, lower neutral fat value, lower cholesterol level (LDL cholesterol), improve intestinal environment and improve constipation To improve, liver and kidney functions are various. Recently the diet effect of mulberry leaves is also drawing attention. It is said that mulberry leaves work well for people with high blood glucose level, obesity, high cholesterol level, high neutral fat value, prevention of lifestyle diseases, etc. "1-deoxynojirimycin" is the key ingredient of the mulberry leaf's blood glucose suppression effect. The carbohydrate ingested from the meal is absorbed into the body by the function of α-glucosidase enzyme on the wall of the small intestine. "1 - deoxynojirimycin" inhibits the action of α - glucosidase, so it slows absorption of glucose and suppresses an increase in blood glucose level. The binding of "1-deoxynojirimycin" is relatively loose, so it does not inhibit the absorption of glucose, it will be slowly absorbed. As a result, the surge of blood glucose after eating is suppressed, and it is effective for the prevention and improvement of diabetes. This action is the so-called action of the low insulin diet itself, and as a result it improves to a constitution that is difficult to get fat to prevent fat accumulation in the body. It is also said that it has a function to suppress blood lipids. Mulberry leaves have a mild diet effect because of the nature of slow absorption of sugar. Others Flavonoids and dietary fiber contained in mulberry leaves reduce cholesterol and triglyceride levels, prevent oxidation of LDL cholesterol by active oxygen, and prevent arteriosclerosis. Mulberry leaves are well-balanced health food for humans. Furthermore, it is said that GABA which is one type of amino acid, has the effect of decreasing fat and cholesterol from blood vessels and liver contains 84 times of soba and 40 times of tea. It is said that the effect of GABA can lower blood pressure and prevent arteriosclerosis and middle wind. In addition, many nutrition such as abundant vitamins (vitamin A, vitamin B 1, vitamin B 2, vitamin C) and minerals (zinc, iron, magnesium, calcium), dietary fiber, flavonoid, carotene, γ-aminobutyric acid (GABA) Effective ingredients are included and there are diabetes prevention, hypertension prevention, neutral fat reduction, cholesterol lowering, constipation improvement, liver / kidney function upward, diet effect and so on. Mulberry leaves contain abundant nutrients that modern people hardly eat, such as calcium equivalent to 60 times the cabbage, iron equivalent to 15 times the Komatsuna, and 10 times the spinach carotene. Experiments using rats have been reported to suppress the increase in body weight and to reduce neutral fat and cholesterol levels in mulberry leaves. Basically, mulberry leaves contain vitamins and minerals rich, as well as leaves used in other green juice, and also contain excellent nutrients such as dietary fiber and protein · carotenoid · chlorophyll. Mulberry leaves are famous as leaves that become sericulture of silkworms in the past but mulberry roots and bark are also crude drugs called mulberry leaves (yakkuhi), and have diuretic action, blood pressure lowering, hypoglycemic action , Antipyretic effect, cough suppressing effects and other effects. Combined use of mulberry leaf extract, propolis and gymnema, banaba, onion concentrate (quercetin) etc. show the effect of improving blood glucose level and diabetes. Mulberry leaves prevent obesity by suppressing the rise in blood glucose levels. It is important to take these appropriately according to your purpose. For example, if it is intended to improve diabetes or diet, it is necessary to suppress the sudden rise in blood glucose level after meals, so it is effective to take it before meals or while eating. It promotes moisture metabolism in the body, and drains waste and excessive salinity out of the body. About 24 times the content of milk. About nutti about 15 times as much iron! Especially beauty in skin such as intestinal cleansing can be effective for beauty such as skin. Also known as "green blood"
It is effective for prevention and improvement of diabetes. "Hypoglycemic effect is the strongest among green plants"
A study on the effect and efficacy of mulberry leaves is underway at Tohoku University School of Medicine, and as a result of its research, blood pressure lowering effect was observed in mulberry leaves. Furthermore, it was confirmed that the hypoglycemic effect is the strongest among the green plants. One of the excellent ability of mulberry leaves is "anti-diabetes action". It is said that if you eat "onion" in line with mulberry leaves, you can further increase its effect. "It suppresses excessive intake of calories"
The diet effect of mulberry leaves has also been confirmed in animal experiments. It inhibits the action of glycolytic enzymes and suppresses excessive intake of calories. By suppressing sugar absorption, it is possible to suppress elevation of blood glucose after meals, which leads to prevention of obesity. The ingredients of mulberry leaves also have the effect of preventing fat accumulation in built-in. Attention is required for visceral fat type obesity. Because it triggers diabetes, blood vessel disease and various lifestyle diseases. What is the effective way to take mulberry leaves? If you expect to control the blood glucose level of mulberry leaves, please take it 15 minutes before meal during meals. If it becomes after meal, the effect of mulberry leaves will become thin. Before meals or after meals, the efficacy of mulberry leaves can not be expected much. ※ The same is true for diet purposes.